Police have arrested a man they said used a sophisticated device to hide his license plate while going through SunPass tolls. 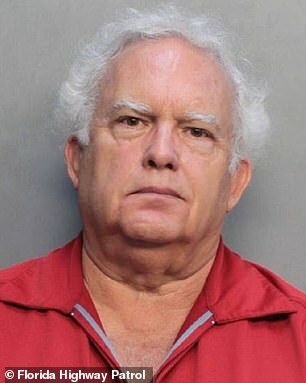 Miami-Dade police said 70-year-old Robert Craig Davis was caught on dashcam using technology to dodge tolls while driving his maroon Chrysler Pacifica. Reached at his home in Key Largo, Davis denied using the now seized plate cover to dodge tolls, but declined to discuss it further with CBS4’s Gary Nelson. Earlier this year, Sammy and Mayte Salinas were driving in Miami-Dade when they saw Davis’ van in front of them with its license plate covered while it went under a row of toll cameras on the Dolphin Expressway. At the next toll by plate cameras, they took out their own camera and, sure enough, recorded as a black cover came down over the plate of the car ahead. After getting clear of the toll by plate cameras, the driver activated a device, lifting the black cover off the license plate. Davis claims the video doesn’t show him lowering the cover as he goes under toll cameras, but the Salinas’s insist they saw him do it through one set of cameras and recorded him using it through the next set. Florida Highway Patrol Lt. Alex Camacho said he spotted the Chrysler with its plate covered Saturday, just after going under toll cameras. The curtain was then lifted. The FHP wasn’t able to locate Davis through his plate number on the Salinas video because it came back to an address where Davis did not live. Lt. Camacho credited CBS4 News for bringing in the video that allowed him to recognize the alleged toll-dodging Chrysler. At the time, we showed the video to the Florida Highway Patrol. “Wow. Incredible,” Trooper Joe Sanchez remarked as he watched the recording of the now you see it, now you don’t license plate. “They’re getting very creative,” Sanchez said, but he said it’s nothing the FHP hasn’t seen before. In fact, they run special details at toll by plate locations to nab drivers with the automated license plate covers. CBS4 News found the things advertised for sale all over the internet; on eBay, Amazon and various gadget websites. Typically, the covers are rolled up in a special license plate frame and are lowered and raised when the driver pushes a button. They sell for $100 or more, or for as little as $15. Sanchez advised against investing in one of them. “At the end of the day, it’s going to be very expensive once we stop you and make that arrest,” Sanchez said. The minimum fine for obscuring your license plate – for any reason, let alone toll fraud – is $179. Once an offender has been found out, Sanchez said the FDOT can use photographic records to identify cars and go after their owners for prior debts, and they’ve had some success. Sanchez recalled one case in which a judge ordered a truck driver to pay more than $3,000 in unpaid tolls. Sanchez said the driver had rigged a system that allowed him to pull a cord, flipping his license plate to point toward the pavement, away from the view of the cameras. Davis was booked on Saturday, according to police.